The Menzingers enjoy the ride on another dazzling punk rock album. Pennsylvania’s the Menzingers are a band who have always mined the imperfections of the past to understand who they are. They are a band unafraid to dig deep into themselves and examine their core. In many ways, this, their fifth record, continues the soul-searching and self-examination they perfected on The Impossible Past. The heartache, insecurity, and isolation of that album found the band uncertainly navigating the perils of maturity. The follow-up Rented World saw the band in something of a quandary as they attempted to figure what do when life becomes more complicated. In truth Rented World was a more insecure and contemplative record as if they were constantly seeking an answer to the question “so what now?”. That’s not to say that they have found the answers in the interim. The opening song on After the Party, “Tellin Lies” sees the band looking back at their 20s through the rear view mirror, posing the question “What are we gonna do now that our 20s are over?” It’s an energetic opening that bowls along before making room for a euphoric, addictive chorus. It quickly becomes apparent that the band has lost none of their punk edge. The anthemic “Thick As Thieves” examines the small pleasures and misadventures that define our youth that never lose their luster. Single, “Lookers”, evokes memories of long forgotten days with poignant memories of “smoke filled dinners” and “Jersey girls”. However, the lyrics avoid becoming bogged down in sentimentality instead suggesting a tacit understanding that those days are gone. The guitars sound full and vital, hammered with the intensity that the lyrics deserve. It also contains one of their finest, sing-a-long choruses to date. Many of the songs on After the Party are testaments to the naivety and carefree nature of youth. “Midwestern States” is a mid-tempo paean to the revealing experiences of being a young band, on tour for the first time. The closing pay off of “But we’re still breathing, and the party ain’t over” suggest that the band, like many of us, are happy to reminisce but still have their eyes firmly locked on the future. 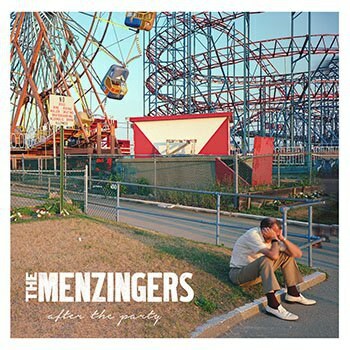 The universal subject matter on the album illustrates that the Menzingers have maintained the down-to-earth commonality which makes every song feel like it is addressed directly at the listener. They dissect the shared experiences that define humanity. For example, “Bad Catholics” concerns both the conflicting emotions of happiness and regret of running into an old flame in your hometown. Likewise, “Wings (Your Wild Years)” summarizes the anxieties of everyday living, experiences that are pertinent to many of us. With each new album, the band have looked to play to their strengths but have never shied away from expanding their sound. On After the Party the band stretch their musical muscles without the album losing any of its momentum. “Bars” is a surprising waltzy drinking anthem, made to soundtrack the clinking of raised beer bottles in dimly lit public houses. The more restrained “Black Mass” allows the band to showcase the power of the vocals illustrating the confidence front man Greg Barnett has in his voice. The title track is another powerful and dynamic rock song, but the band is self-assured enough to allow the rhythm section to take the strain. Even more impressively, “Charlie's army” is a spunky, bouncy pop-punk song but infused with a '60s pop sensibility, playing like a cover of a lost girl group classic by the Shangri-la's or the Angels. With this album, the band took more time writing the songs going through a lengthy pre-production process which has benefitted the finished articles. The arrangements sound fuller, larger in scope and a bit more refined. Despite its rather misleading title After the Party is an upbeat and surefooted album. It is a stark reflection on getting older but maintains a youthful, sometimes mischievous spirit. The band still see the romance in the places and the people they have left behind but have no intention of letting that define their future.The band sound at ease, like the weight, has been lifted from their shoulders with little evidence of any cathartic rage being exercised. What is left is a superlative set of authentic punk songs that stand as their finest achievement to date.